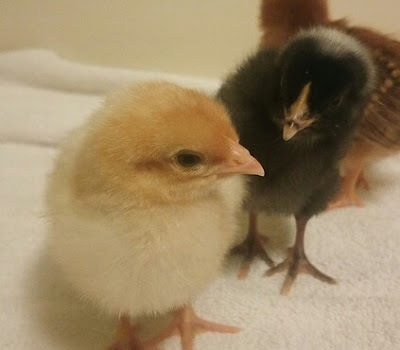 The chicks have been home for a week today. I can't believe how much they've grown in just one week! I thought I should probably share some updated pics of the girls. I'll start with the fluffies. Austro and Esther/Edie (What should I call her? And why am I having such a difficult time with this?) are just so darn fluffy. Our Black Australorp, Austro, is super fluffy, and such a sweet bird. She's very calm and not a lot bothers her. She definitely tolerates being held the best. I think she's my favorite, both due to her coloring--her wings are so pretty--and to her temperament. Our Easter Egger is also very fluffy. This bird reminds me of a gentle giant who doesn't quite know how to fit in. She's always up in her sisters' faces, pecking at them, but not maliciously--more because she wants to interact with them but isn't sure how. If someone is off by herself, doing her own thing, she's usually the one. She also likes to look at herself in the mirror. Next we have the not-quite-as-fluffies. This is our Rhode Island Red, Red. She is the most curious of the birds, and probably the most impulsive as well. 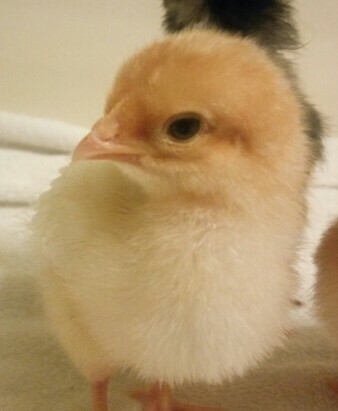 When I put my hand down into the brooder, she's always the first one to run over and investigate. Red sleeps a lot. Quite often the rest of the birds will be out eating and drinking and doing chicken things, but Red will be nowhere to be seen, sleeping away under the mama-hen heating pad. That first day, I thought she was dead at least 5 times because of the way she sprawled out while sleeping. As you can see, Red's feathers are beginning to come in. I wish she would keep this coloration as an adult--it's so pretty. Here's Rocky, our Barred Rock. She's the instigator. She's trying to mount an escape attempt, and I do believe she's smart enough to succeed, given enough time. She keeps digging at the edges of the brooder (and getting everybody else to join in), and pecking the walls, like she's testing to see how sound they are. 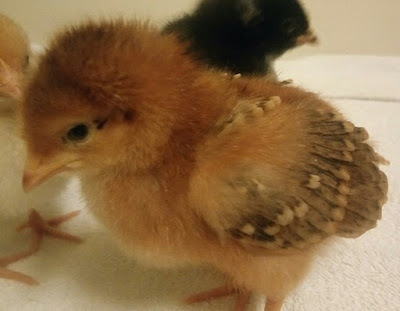 She was also the first one to fly a little (at first they would take a running leap off the top of the mama-hen heating pad, furiously flapping their little wings, but now they're genuinely flying a bit), the first to perch, and the first to take a "dust bath." Sorry she's a little blurry--she's fast--but you can make out the beginnings of the bar pattern on her wings, and you can also really see the tail feathers starting to take shape. And this is our Cinnamon Queen, Toasty-Crunch. She's Hubby's favorite, I think because she looks the most like what he thinks a chick should look like: yellow and fluffy. She's Rocky's right-hand bird--she follows Rocky everywhere. She's also the most nervous of the chicks. She runs away peeping loudly whenever I put a hand down into the brooder. And, she's the messiest. This girl can single-beakedly empty a quart of chick food onto the floor of the brooder in less than an hour. The co-conspirators. I wonder what new plan Rocky is whispering in Toasty-Crunch's ear. The mama-hen is working out really well. I'm glad I decided to go that way. The girls like to sleep under or hang out on top--last night Bubby called me in to show me that they were all snuggled up together on top. So sweet. One of the advantages of using a heating pad instead of a light for heat is that I can turn out the light and then it's bedtime. We don't hear from the girls all night, and they've learned early about wake and sleep cycles. From what I've read, the light from a heat lamp can disrupt the natural sleep pattern.